"Do not follow where the path may lead... Go instead where there is no path and leave a trail." There is no greater praise for ones effort than the attempt of duplication. Since the first IKF Amateur Championship Tournament in 1999, 7 other kickboxing sanctioning bodies have started hosting annual amateur kickboxing tournaments. (WKA, USKBA, KICK, WKKO, WAKO AND TBASA) Their addition has pulled some gyms/camps away from the Annual IKF Tournament which like anything being diluted, dropped the number of fighters attending over the last two years. Whether the days of 200 plus fighters (2001, 02, 03, 04 & 05) attending the IKF Tournament are long gone or only on a brief absence for now, the IKF continues to bring the most prestigious and most rewarding open amateur tournament to those willing to truly "Walk the Walk" against fighters from around the world instead of just a basic region like many of the other North American hosted tournaments. As for numbers, the IKF World Classic has continued to draw the largest number of amateur fighters of all the tournaments mainly due to it's reputation of being the true "Golden Gloves" of Amateur kickboxing. This year was no different. This years event hosted some of the greatest fights in Tournament History and some of the most devastating Knockouts we have ever seen. There is an old saying Johnny Davis brought up at the end of the day... "A rough start often results in a Great Finish!" Davis was right. The rough start was related to what happened less than 5 minutes before the prepared start time. One of the boxing rings support welds at the corner posts exploded apart leaving us with only one ring to fight in. With the honest acceptance of realizing we we may have only one ring for the entire event, somewhat of a minor miracle happened. The combination of the staff at the Marriott World Center and some help from Jeff Berch of South Carolina, the ring was re-welded and back in business in less than 2 hours. From the moment both rings were going, the event gained steam, shifted into high gear and never looked back! Saturday saw the completion of "75" bouts. For the first time since the first year of the Tournament, we decided to add all the 2 fighter brackets to the end of the Saturday schedule for their Championship bouts. The decision was a popular one as well as a smart one. Of the scheduled 50 title belts planned to take place, three of the 50 did not happen and instead earned a fighter in each one a win by forfeit. This decision also aided in the much desired early completion time of Sunday's Championship Bout schedule (Around 2:00 PM) which earned praised reviews from all the fighters looking to have time to relax around the hotel or help with an early start on some long drives home. In the end, this years event saw 122 bouts take place over the two days of competition. This of course did not include the IKF Point Kickboxing portion of the Tournament which was presented as an "Introduction/Exhibition Style" for the Tournament. 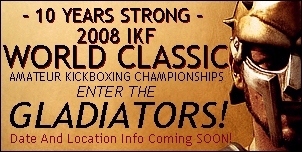 In 2008, IKF PKB will be instated as a full style sanctioning far more tournaments around the world than the current IKF/PKB sanctioning schedule. So much to talk about, so many great fights, but few who saw it will ever forget the most devastating and quickest spinning backhand we have ever seen! A Shot performed by John Greubel of Augusta, Georgia, USA on Rolando Luna of Dalton, Georgia, USA in their Championship bout Sunday. The result was a KNOCK OUT victory at 38 seconds into the first round for a title that now stands alone, Greubel's "SIXTH" IKF Tournament title. This one was for the Welterweight Full Contact Rules title and gave Greubel a perfect amateur record of 21-0! His plans now are to start his pro career with the WCL, World Combat League later this fall. Good luck John. So many more stories can be told from what will go down in history as not the Largest Tournament by numbers, but SURLY the BEST IKF Tournament Ever! A Perfect example of how QUALITY far overshadows numbers. This will be hard to beat next year, which makes next years "10 Year Anniversary Event" all the more exciting to look forward to, and for us here to plan for. From all this growth at the amateur level, the opportunities available to the current amateur fight pool will bring the much needed attention back to the amateurs as well as work to build back the Professional Kickboxing Rankings. We are excited about the future! 1 REGISTERED JUNIOR GIRL "NO SHOWED"
SECOND: Samantha Schuldt, Fredricksburg, Virginia, USA, (1-3/0, 62, 4', 9, Chris Manuel, (540) 907-1428) by KO at 1 minute of round 1. Kassandra G. Salazar, of Brownfield, Texas, USA, (1-1, 55, 8, 10-14-98, Martin M. Salazar, (806) 637-8906) no showed without any call to the IKF. SECOND: Danielle Byrne, Chicago, Illinois, USA (3-4, 115, 5'2", 16, 2-2-91, Jim Klauba, (773) 859-5150) by unanimous decision, 29-25 on all 3 judges cards. CHAMPION: Victoria Beltran, San Diego, California, USA, (16-4-2, 119, 5'3", *14, 10-3-92, Victor Beltran, (619) 429-8269) won her title by walkover forfeit after her opponent, Catherine Thompkins (Sheridan, Arkansas, USA K: 0-0, AB: 4-6, 120, 5'3", 16, 4-31-91 Danny Dring, (501) 834-3537) father called IKF in Orlando informing us that her aunt had just died and would not be able to make the event. SECOND: Alyssa Defazio, Wittmann, Arizona, USA (5-0/2, 135, 5'9", 15, 11-12-91, Self, (623) 581-0517 ) by Split decision 29-28, 30-28 & 28-29. 2 REGISTERED JUNIOR BOYS "NO SHOWED"
SECOND: Cord Conaway, Wittmann, Arizona, USA (Belvedere, Georgia, USA, 4-1/0, 66, 4'6", 10, 6-10-97, Mark Greubel (706) 737-0911 ) by unanimous decision 29-28, 30-27 & 30-27. Cord Conaway, defeated Austan Whitehurst, Thunder Bay, Ontario, Canada, (4-2, 72, 4'4", 11-16-95, 11, Mitz Bandiera, (807) 623-5425) by unanimous Decision, 30-27, 29-28 & 30-27. Logan Howard, defeated Nick McCall, Adel, Georgia, USA, (1-2, 64, 4'2", 11, 11-25-95, Walter McCall (229) 848-7278) by unanimous Decision, 30-27 on all 3 judges cards. Cord Conaway, defeated Colton Reifert, Fredricksburg, Virginia, USA, (0-2/0, 68, 4'5",10, 11-2-96, Chris Manuel, (540) 907-1428) by unanimous Decision, 30-25, 30-26 & 30-26. Kristopher M. Salazar, Brownfield, Texas, USA, 0-1, 65, ?, *9, 8-12-97, Martin M. Salazar (806) 633-8906 - No showed at the event. SECOND: Kaden Fondren, Nampa, Idaho, USA, (10-3/4, 62, 4'5", 9, 11-18-97, Chris Reyna, (208) 463-9999) by split Overtime Round decision. After 3 rounds all 3 judges had it 28-28. In the overtime round, the judges were split 2-1. - Promoters: This bout would be a VERY Exciting rematch! Alexander Dumas, won his prelim bout by forfeit when his opponent, Brock McCoy (Moultre, Georgia, USA, 2-*1/0, 65, 4'6", 9, 7-7-98, Richard Cox, (229) 821-0123) decided not to fight once arriving Saturday morning. *McCoy was given the forfeit loss and Dumas a forfeit win. Kaden Fondren, defeated Tyler Chavous, Evans, Georgia, USA, (1-1/0, 62, 4'3", 8, 11-20-98, Mark Greubel, (706) 737-0911) by unanimous Decision, 29-28, 29-28 & 30-27. Junior Lightweight 75.1 - 85 lbs. SECOND: Tyrahn Watkins, Simpsonville, South Carolina, USA, (1-1, 85, 4'6", 9, 12-17-97, Ray Thompson (864) 967-3030) by equipment forfeit. Watkins came to the ring without his cup. He was given the allowed 5 minutes to attain it, but could not find it. Avery Tuck, defeated Miklo Lara, Camp Verde, Arizona, USA, (0-1, 76, 4'3", 8, 3-3-99, Richard Williams (928) 300-0281) by unanimous Decision, 30-27 on all 3 judges cards. SECOND: Abel Alhambra, San Diego, California, USA, (12-5, 79, 5', 1-25-99, 12, Victor Beltran, (619) 429-8269) by unanimous decision, 30-27 on all 3 judges score cards. Nicholas Torrance, defeated John Griego, Camp Verde, Arizona, USA, (0-1, 76, 4'6", 11, 1-14-96, Richard Williams (928) 300-0281) by TKO at 1:19 of round 1. Junior Welterweight 88.1 - 98 lbs. SECOND: Garrett Martin, Greenville, South Carolina, USA, (1-2/0, 90, 4'9", 10-12-95, 11, Ray Thompson, (864) 967-3930) by unanimous decision, 30-27 on all 3 judges score cards. Gilbert Vasquez Jr., defeated Nicholas A. Chinchilla, Antioch, California, USA, (0-1, 90, 5'0", 12, 11-8-94, Professor Dennis Guila (925) 354-3434) by Split decision, 29-28, 29-28 & 27-30. Junior Middleweight 90.1 lbs. - 100 lbs. - 40.95 Kg - 45.45 Kg. SECOND: Jeremy Fortune, Fredricksburg, Virginia, USA, (3-2/0, 92, 5'1", 14, 2-19-93, Chris Manuel, (540) 907-1428 ) by unanimous decision, 30-27, 30-27 & 30-28. Blake Bowman, defeated Nathan McCall, Adel, Georgia, USA, (0-7, 92, 4'11", 14, 4-3-93, Walter McCall, (229) 848-7278 ) by Split decision, 29-28, 28-29 & 27-30. Jeremy Fortune, defeated Xavier Jimenez, Camp Verde, Arizona, USA, (0-1, 95, 5'2", *13, 7-20-93, Richard Williams, (928) 300-0281 ) by TKO at :53 seconds of round 1. SECOND: John C. Marone, Simpsonville, South Carolina, USA, (4-2, 106, 5'0", 12, 6-29-95, Ray Thompson (864) 967-3930 ) by Split decision, 30-27, 30-27 & 28-29. 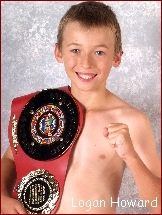 MUAY THAI RULES - AGES 13-15 - Title Belt Presenter: Alan Watson. SECOND: Jose Silva, Chula Vista, California, USA, (2-2, 118, 5'3", 13, 3-31-94, Victor Beltran, (619) 429-8269 ) when Silva's trainer threw in the towel at :49 seconds of round 2. Dan Loikits, defeated Tyler Price, Pfafftown, North Carolina, USA, (18-4/3, 107, 5'2", 15, 7-10-92, Frank Price (336) 692-1070 ) by unanimous decision, 29-28, 30-27 & 30-27. Dan Loikits was 0-0 when he entered the Tournament. 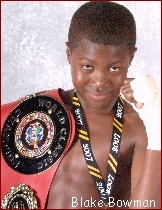 SECOND: William Hayes, Detroit, Michigan, USA, (3-1/0, 128, 5'6", 7-6-93, 14, Elliott Cooper, (313) 581-5085) by TKO at :42 seconds of round 2. Blain Nobles defeated Jordan Pierson, Roswell, Georgia, USA, (0-1/0, 125, 5'4', 14, 2-4-93, Eddie Monger, (770) 998-280 ) by unanimous decision, 30-26, 30-25 & 30-25. Blain Nobles was 0-0 when he entered the Tournament. SECOND: Anthony Ramsey, Harnsbury, North Carolina, USA, (0-1, 124, 5'7", 15, 5-19-92, Mr. Ramsey, (704) 455-8183) by unanimous decision, 30-27, 29-28 & 29-28. Ephrain Reliford was 0-0 when he entered the Tournament. Aaron Pegg of Vacaville, California, USA, (0-0, 125, 5'5", 2-28-92, 15, Aurelio Pegg, (707) 447-7699) was a no show at the event. SECOND: Seth Grabinsky, Calgary, Alberta, Canada, USA, (2-4/0, 130, 5'8", 17, 12-14-89, Trevor Smandych, (403) 208-1296) by TKO at 1:21 of round 1. Chad Monyelle defeated Robert Steger, Orlando, Florida, USA, (0-1, 120, 5'7", 17, 11-14-89, David Cummings, (407) 409-0430) by KO at 1:18 of round 3. Seth Grabinsky defeated Sergio Lopez, San Diego, California, USA, (4-5, 129, 5'9", 9-30-89, 17, Victor Beltran, (619) 429-8269) by stoppage due to unintentional injury at 1:43 of round 1. SECOND: Devin Smith, Beloit, Wisconsin, USA, (4-5, 134, 5'7", 14, 9-3-92, Craig Monyelle (815) 389-8501 ) by unanimous decision, 30-27, 30-26 & 30-26. Taylor Krahl defeated Michael Reid, Minooka, Illinois, USA, (7-2/0, 131, 5'5", 2-4-94, 13, Peter Farias, Father's #: (815) 735-6191 ) by unanimous decision, 30-28, 30-27 & 30-27. SECOND: Robbie Newton, Bishop Auckland, Newcastle, England, (13-1/0, 140.8, 64kg, 5'10", 17, 11-25-89, Paul Pearson, 0044-7787-830-107) by Split decision, 29-28, 28-29 & 29-28. Bruce Neil Lutchmedial defeated Adam Bronconnier Calgary, Alberta, Canada, (2-2/1, 147, 5'10", 17, 6-22-90, Mike Miles (403) 244-8424 ) by unanimous decision, 30-27, 30-27 & 29-28. Robbie Newton defeated Peter Cardena, Weston, Florida, USA, (1-3/0, 146, 5'9", 17, 6-28-90, Jose Mauricid, (954) 472-2554 ) by TKO at the break of round 2 & 3. Bruce Neil Lutchmedial was 0-0 when he entered the Tournament. 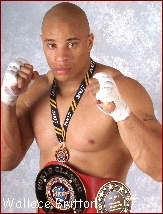 SECOND: Devin Ward, Florida, USA, 1-1, 151, 5'8", 16, Mark Kern, (407) 830-7111) by TKO at :50 seconds of round 3. Devin Ward defeated Dylan Willis Hahira, Georgia, USA, (0-1, 155, 6'1", 15, 1-8-92, Jason McCranie (229) 549-0163) by unanimous decision, 30-28, 30-27 & 30-27. SECOND: Alex Barnes, North Little Rock, Arkansas, USA (3-1/1, 160, 5'9", 16, 3-17-91, Danny Dring, (501) 834-3537) by unanimous decision 30-27, 30-27 & 29-28. 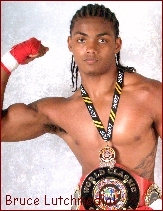 Alex Barnes, defeated Rickey Baez, Augusta, Georgia, USA, (0-1/0, 152, 6', 17, 6-3-90, Mark Greubel, (706) 737-0911) by unanimous decision, 30-27, 29-28, 29-28. Darryn McDade Jr. was 0-0 when he entered the Tournament. SECOND: Angel Gabriel Rodriguez, Apopka, Florida, USA, (1-1/0, 155, 5'9", 16, 11-29-90, Angel Ortiz, (321) 439-7093) by unanimous decision 29-28, 28-27 & 30-27. Middleweight 160.1 lbs to 170 lbs. 72.77 kg - 77.27 kg. SECOND: Chuck Anderson, Hinkley, Minnesota, USA, (6-1/0, 165, 5'10", 16, 1-2-91, Bobby Anderson, (320) 384-7409) by overtime round unanimous decision. After three rounds the score was 28-28, 28-28 and 29-28 (Anderson) - In the 4th round of a great fighting round, Kauth scored the unanimous nod from all 3 judges. Logan Kauth defeated Jesse Price, Martinez, Georgia, USA, (1-3/0, 165, 6'1", 4-8-91, 16, Bobby Wilson, (706) 799-3201 ) by TKO at 59 seconds of round 2. Chuck Anderson defeated David Rowe, Florida, USA, (0-1, 162, 5'10", 16, Mark Kern, (407) 830-7111) by unanimous decision 29-28, 29-28 & 29-28. Logan Kauth was 0-0 when he entered the Tournament. 1 REGISTERED WOMAN "NO SHOWED"
SECOND: Alana Dunbrack Calgary, Alberta, Canada (1-2/0, 109, 5'1", 25, 7-9-82 Mike Miles (403) 244-8424) by unanimous decision, 30-27 on all 3 judges score cards. Alana Dunbrack defeated Kelli Cooper, Evans, Georgia, USA (2-2/1, 109, 5'2", 18, 6-8-89 Mark Greubel, (706) 284-5926) by TKO at 1:29 of round 2. SECOND: Brenda Harrison Roswell, Georgia, USA (11-4/0, 1 NC, 117, 5'6", 9-26-73 Eddie Monger, (770) 998-280) by split decision, 30-27, 29-28 & 28-29. Stacy Chung defeated Lisa A. Wells South Beloit, Illinois, USA (6-7, 119, 5'6", 32, 12-18-74 Craig Monyelle (815) 389-8501) by unanimous decision 29-28, 29-28 & 30-27. SECOND: Mariea Snyder, Sherwood, Arkansas, USA (4-2, 119, 5'2", 31, 8-16-75, Danny Dring (501) 834-3537) by split decision, 30-27, 30-27 & 28-29. Mariea Snyder defeated Stephanie Swain Kernersville, North Carolina, USA (1-3, 112, 5'4", 18, 4-18-89 Frank Price (336) 692-1070) by unanimous decision 30-27, 30-28 & 29-28. SECOND: Stephanie Marshall, Calgary, Alberta, Canada (2-5/1, 117, 5'2", 20, 9-17-86 Mike Miles (403) 244-8424) by Split decision, 29-28, 29-28 & 28-29. Kathleen Wise defeated Denise Jacobs Orlando, Florida, USA (0-1/0, 120, 5'4", 35, 10-29-70 David Cummings, (407) 409-0430) by split decision, 29-28, 29-28 & 28-29. Stephanie Marshall defeated Melissa Reaume Calgary, Alberta, Canada (0-1/0, 118, 5'6", 23, 3-1-84 Trevor Smandych, (403) 208-1296) by split decision, 30-28, 29-28 & 28-29. Kathleen Wise was 0-0 when he entered the Tournament. FULL CONTACT RULES: Title Belt Presenter: Alan Watson. SECOND: Linda Custodio, Brooklyn, New York, USA (0-1, 130, 5'5", 1-3-80 Reilly Bodycomb, (646) 491-2771) by unanimous decision, 30-26 on all 3 judges score cards. Brittmey Laamanen defeated Deborah Pumphrey North Little Rock, Arkansas, USA (1-1/0, 129, 5'6", 30, 3-20-77 Danny Dring, (501) 834-3537 ) by overtime round unanimous decision. After three rounds the score was 28-28, 28-28 and 29-26 (Laamanen) - In the 4th round of a great fighting round, Laamanen scored the unanimous knod from all 3 judges. Brittmey Laamanen was 0-1 when he entered the Tournament. SECOND: Brittany Brown Lenox, Georgia, USA (0-1, 138, 5'4", 18, 4-23-89 Walter McCall (229) 848-7278) by TKO at :42 seconds of round 1. SECOND: Natalya Speece Imperial Beach, California, USA (6-5, 135, 5'3", 12-19-90, 16 Victor Beltran, (619) 429-8269) by unanimous decision, 30-27 on all 3 judges score cards. Jamie Bradleyn was 0-0 when he entered the Tournament. Hollie Mullins (Indianapolis, Indiana, USA (0-0/0, 140, 5'7", 22, 7-12-84 Ray Sarkine, (317) 241-5425) was a no show at weigh-ins. Joanna Airall (Maitland, Florida, USA 2-1/0, 140, 5'8", 26, 9-28-80 Bonnie Camino, (904) 925-1143) was not allowed to fight by the IKF when it was confirmed after the official weigh-ins that she had fought Chrisanne Roseliep in a professional kickboxing bout on September 9, 2006 at the Shindo Kumate in Tampa, Florida, USA. For details Click Here. SECOND: Rebekah Verdin, Simpsonville, South Carolina, USA (1-1/0, 150, 5'4", 20, 2-3-87 Ray Thompson, (864) 967-3030) by split decision, 29-28, 29-28 & 28-29. Sonja Foster defeated Brittany Flesch, Florida, USA (0-1, 142, 5'10", 18, 1-30-89 Mark Kern, (407) 830-7111 ) by unanimous decision, 30-27, 30-27 & 30-28. Rebekah Verdin defeated Karenina Espinoza, Antioch, California, USA (1-1, 140, 5'5", 18, 12-16-88 Professor Dennis Guila (925) 354-3434 ) by unanimous decision, 30-26, 30-24 & 30-25. SECOND: Liz Viramontes of San Bernardino, California, USA (1-1/0, 146, 5'6", 27, 11-11-79 Jim VanOver, (760) 900-8289) by overtime round unanimous decision. After three rounds the score was 28-28 on all three judges score cards. In the 4th round of a great fighting round, Doyle scored the judges decision. SECOND: Danielle Wilson Lakeland, Tennessee, USA (2-3, 199, 5'6', 5-23-77, 30, Jonathan Border, (901) 283-0871) by unanimous decision, 29-28 on all 3 judges score cards. 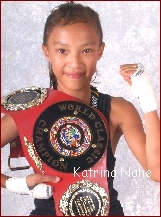 Natalie D. Cavin, defeated Constance Thomason of Greenville, South Carolina, USA (4-2, 182, 5'11", 38, 8-1-68 Ray Thompson (864) 967-3930 ) by head Kick KO at 1:48 of round 2. 7 REGISTERED MEN "NO SHOWED"
1 Registered man showed up - but was unable to fight due to an injury. 2 Registered thought to have their visa's but did not. SECOND: Mike Chesbro, Brooklyn, New York, USA (0-1, AB: 1-1, 127, 5'4", 22, 11-1-84 Reilly Bodycomb, ( 646) 991-2771) by unanimous decision, 30-27 on all 3 judges score cards. Deejay Jones defeated Jorden Allan Thunder Bay, Ontario, Canada (10-7-1/2, 130, 5'5", 20, 6-17-87 Mitz Bandiera, (807) 623-5425 ) by unanimous decision, 30-27, 30-27 & 29-28. Matthew Thomas OF Fredericksburg, Virginia, USA 4-6/0, 130, 5'11", 25, 9-5-81 Chris Manuel, (540) 907-1428 was a No Show at Weigh-ins. SECOND: Jessy Jimenez of Camp Verde, Arizona, USA (1-1/0, 140, 5'6", 27, 11-12-79 Richard Williams (928) 300-0281) by unanimous decision, 29-28 on all 3 judges score cards. 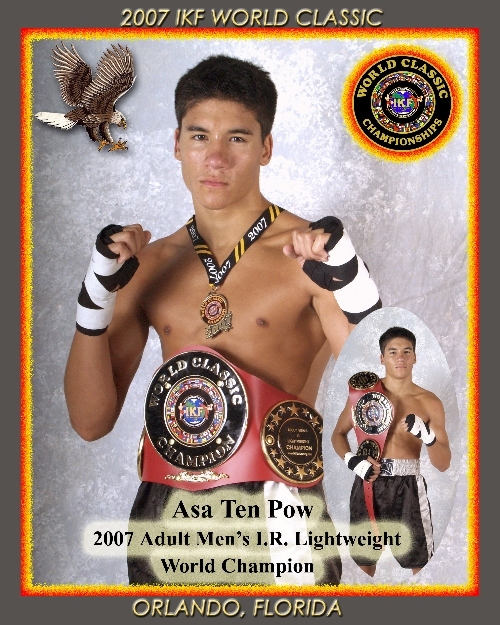 Asa Ten Pow defeated Zein Alziyadi of Detroit, Michigan, USA (7-4/0, 131, 5'11", 2-13-80, 19 Elliott Cooper, (313) 581-5085 ) by unanimous decision, 30-26. 30-26 & 29-27. Jessy Jimenez defeated Marlon Telmo of Fairfield, California, USA 0-0, 132, 5'8", 9-20-77, 29 Aurelio Pegg, (707) 447-7699) by split decision, 29-27, 29-27 & 28-29. SECOND: Jessy Jimenez of Camp Verde, Arizona, USA (1-1/0, 134, 5'6", 27, 11-12-79 Richard Williams (928) 300-0281) by TKO at 1:50 of round 3. SECOND: Rolando Luna of Dalton, Georgia, USA (5-5/3, 150, 5'6", 35, 8-17-71 Ben Kiker, (706) 226-3318) with one of the most "Devastating" spinning backhands we have ever seen! the result was a KNOCK OUT victory at 38 seconds into the first round. John Greubel defeated David Thomas Fredericksburg, Virginia, USA (10-5/1, 141, 5'11", 25, 9-5-81 Chris Manuel, (540) 907-1428 by TKO at 1:28 of round 1. Rolando Luna defeated Adam Shradnick of Congers, New York, USA (0-1, 150, 23, 12-14-83 Self (845) 507-2683) by TKO at 1:31 of round 1 via 3 knockdown rule. John Greubel the ONLY 6 Time Tournament winner. Gruebel has plans to turn Professional this fall as he becomes a part of the WCL, World Combat league. SECOND: Roman Shakhmanov of Orlando, Florida, USA (2-1, MMA: 1-0, B: 2-0, 148, 5'6", 22, 12-13-84 David Cummings, 407-409-0430) by unanimous decision, 29-28, 30-27 & 30-27. Nathan Key defeated Victor Romero Camp Verde, Arizona, USA (2-1/2, 147, 5'9", 17, 8-4-89 Richard Williams (928) 300-0281) by unanimous decision 30-27 on all three judges score cards. Roman Shakhmanov defeated Brandon Telmo of Concord, California, USA (0-1, 141, 5'6", 1-26-83, 24 Aurelio Pegg, (707) 447-7699) by TKO at end of round 2. Jonathan Cances of Vacaville, California, USA (0-0, 149, 5'9", 6-6-82, 25 Aurelio Pegg, (707) 447-7699) was a NO SHOW! SECOND: Michael Musto of Calgary, Alberta, Canada (10-4/3, 147, 5'8", 23, 10-6-83 Trevor Smandych (403) 208-1296) by KO at 1:50 of round 1. Michael Musto defeated Benjamin Culbertson of Polo, Illinois, USA (6-1/2, 149, 5'9", 21, 2-3-86, Trirong Khuntanga, (815) 184-8499) by split decision, 29-27, 29-28 & 28-29. Eric Dunston defeated Paul Bennett-Miranda of Alpharetta, Georgia, USA (0-1, 150, 5'8", 12-16-70 Self, (770) 667-3243) by TKO at 1:33 of round 1. Michael Musto defeated Michael Alhambra of San Diego, California, USA (0-1/0, 147, 5'9", 5-16-89, 18 Victor Beltran, (619) 429-8269) by TKO at 1:39 of round 3. SECOND: Brad Taylor of Warrenville, South Carolina, USA (9-7/0, 158, 5'10", 30, 3-16-77 Mark Greubel, (706) 737-0911 ) by unanimous decision, 30-28, 29-28 & 29-28. Brad Taylor defeated Gabriel Montalvo of Gainsville, Florida, USA (3-2/1, 155, 5'6", 21, 2-21-86 Mike Lindermuth, (352) 333-3075 ) by unanimous decision, 29-28, 30-27 & 29-28. Dusty Winkles defeated Ever Barrera of Thunder Bay, Ontario, Canada (0-2/0, 159, 5'8", 26, 3-31-81 Mitz Bandiera, (807) 623-5425 ) by unanimous decision, 30-27 on all 3 judges cards. Brad Taylor defeated Dan Silny of Miami, Florida, USA (0-1/0, 157, 5'9", 25, 6-2-82 Self, (305) 903-1293) by unanimous decision, 30-25, 30-26 & 30-25. Michael Rickard of Mauldin South Carolina, USA (1-1, 157, 5'11", 24, 7-14-83 Ray Thompson (864) 505-4237) was a NO SHOW. SECOND: Brunon Sokolowski of Skareysko - Kam, Poland (5-1/1, 158, 5'11", 25, 10-29-89 Jaroslaw Rogala, 8602278113) by unanimous decision, 30-27, 30-27 & 29-28. Abraham Han defeated Steven Price Jr. of Martinez, Georgia, USA (0-2/0, 155, 5'11", 18, 5-17-89 Bobby Wilson, (706) 833-7177 ) by knock out at 19 seconds into round 1. Michael Sampayan of Fairfield, California, USA 0-0, 160, 5'6", 5-17-70, 37 Aurelio Pegg, (707) 447-7699) was a NO SHOW. SECOND: Haroon Qureshi of Atlanta, Georgia, USA (1-1/1, 160, 6', 27, 8-1-79 Gary Brown, (678) 205-2083) by unanimous decision, 29-28, 30-27 & 29-28. Kenny Finister of San Bernardino, California, USA (14-4/2, 158, 5'9", 30, 6-8-77, Jim VanOver, (760) 900-8289) arrived on Friday night but informed the IKF that his doctor informed him that his knee injury was still not healed enough to fight. So he stayed to assist his trainer as a cornermam. (*) Combining Of Two Weight Divisions - Top of Middleweight & Bottom of Light Heavyweight. 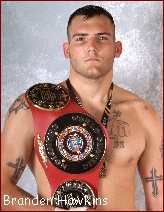 FULL CONTACT RULES: Title Belt Presenter: Chris Manual - IKF Virginia Promoter. SECOND: Moe Abdulla of Dearborn, Michigan, USA (3-1/1, 170, 6'1", 8-9-87 Elliott Cooper, (313) 581-5085 ) by TKO at 1:30 of round 2. Moe Abdulla defeated Bryan Koza of Wauconda, Illinois, USA (8-1/2, 170, 5'9", 27, 2-26-80, Shihan Joe Gangi, (847) 526-0686) by split decision, 29-28, 29-28 & 28-29. Jesse James defeated Travis Jones of Blairsville, Georgia USA (6-4-1/2, 172, 6', 7-23-76, Ben Kiker, (706) 226-3318 ) by split decision, 29-28, 29-28 & 27-29. Bryan Koza defeated Joseph Corneroli of Graer, South Carolina, USA (0-1/0, 170, 5'11", 19, 5-25-88 Ray Thompson (864) 967-3030) by split decision, 29-28, 29-28 & 28-29. Jesse James defeated Kasey Corless of Florida, USA (3-1/1, 172, 6'2", 18, 12-12-88 Jim Wilson, (407) 339-8455) by split decision, 29-28, 29-28 & 27-29. 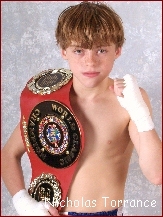 Kenny Burke of Houston, Texas, USA, 4-0/0, 170, 5'11", 7-1-81 Self, (832) 754-5723) was a NO SHOW. 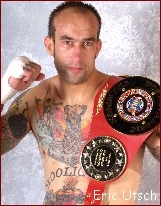 INTERNATIONAL RULES: Title Belt Presenter: Ray Thompson IKF South Carolina Promoter. SECOND: Jason Moore of Detroit, Michigan, USA (25-3-1/2, 175, 6'2", 27, 4-12-80 Elliott Cooper (313) 581-5085 ) by unanimous decision 29-28, 30-27 & 30-27. Jason Moore won by forfeit over Lee Yokota of Jupiter, Florida, USA (2-1/0, 170, 6'1", 25, 10-25-81 Self, (561) 644-7952) when Yokoto announced to the IKF he injured his knee too severely in his previous bout to continue. Sean McKinnon defeated Floyd Savoy of San Franciso, California, USA (AKB-9-3-1/3, AB 6-5/1, 170, 5'9", 34, 1-17-73 Mark Tabuso (650) 871-5589 ) by unanimous decision 29-28, 30-27 & 30-27. Lee Yokota defeated Jared Clauss of Orlando, Florida, USA (1-1/1, 175, 29, 12-15-77 Sean Cochran (407) 281-9231) by split decision, 29-28, 30-27 & 28-29. SECOND: Adam Moss of Indianapolis, Indiana, USA (1-1/0, 162, 6', 20, 9-22-86 Ray Sarkine, (317) 241-5425) by split decision, 29-28, 30-27 & 28-29. Eric Vtsch defeated Bryan Campbell of Calgary, Alberta, Canada (8-7/3, 168, 5'10", 31, 7-6-76, Mike Miles, (403) 244-8424) by unanimous decision, 30-27 on all 3 judges cards. Adam Moss defeated Patrick Greene of Houston, Texas, USA (1-3/1, 169, 5'11", 29, 9-18-77, Joe McDaniel, Patrick: (713) 240-5990) by unanimous decision, 30-26 on all 3 judges cards. Andrei Trafimchyk of Grodno, Belarus, 10-4, 77kg/169, 180sm, 5'9", 22, 8-27-84 Evgeni Kotelnikov & Alfit Khakov, +375-29-6135531 thought he had his Visa in order but apparently did not. SECOND: Douglas C. Metrish of Indianapolis, Indiana, USA (1-1-0, 179, 5'11", 27, 4-11-80, Ray Sarkine, (317) 241-5425) by Knock Out at 1:49 of round 2. Scott Clark defeated Bruno Lurette of Kedgwick, New Brunswick, Canada (13-3/5, 180, 6'2", 32, 1-12-75, Reginald Lurette, (506) 284-2323) by TKO round 1:12 of round 3. Douglas C. Metrish defeated Randolph Hull of Detroit, Michigan, USA (3-2/0, 175, 5'8", 9-20-73, Elliott Cooper, (313) 581-5085) by split decision, 29-28, 29-28 & 28-29. SECOND: Mostafa Sabeti of Port Coquitlam, British Columbia, Canada (81-9-2/15, AB: 1-0, 189, 6'2", 26, 12-9-80 Michael McDonald, Mostafa: (778) 836-480) by injury stoppage at 1:42 of round 1. Sabeti dislocated his shoulder and was unable to continue. David Boles defeated Adam McDermid of Mt. Iron, Minnesota, USA (16-4/1, 188, 6'2", 3-31-82 Self, (218) 780-8648) by majority decision, 28-28, 30-26 & 29-27. Adam McDermid defeated William Jerrels of Gainsville, Florida, USA (0-2/0, 184, 5'10", 40, 8-6-67 Mike Lindenmuth, (352) 333-3075) by TKO at end of round 1. Mostafa Sabeti defeated Joshua Spencer of Conway, Arkansas, USA (0-1, 189, 5'9", 29, 11-22-77 Danny Dring, (501) 834-3537) by uunanimous decision, 29-28, 30-27 & 29-28. SECOND: Jefferson Thiel of Houston, Texas, USA (4-1, 186, 6'1", 26, 8-23-80 Kru Pons (832) 330-1043 ) by unanimous decision 30-27 on all 3 judges cards. Jefferson Thiel defeated Jeff Langford of Middleburg, Florida, USA (2-2, 187, 6'1", 35, 9-23-71 Gene Bautista (904) 338-3550) by unanimous decision 29-28 on all 3 judges cards. Branndon Hawkins defeated Jason Bradley of Loogootee, Indiana, USA (0-1/0, 186, 6'2", 22, 4-18-85 Ray Sarkine, (317) 241-5425) by split decision 30-27, 29-28 & 28-30. Jeff Langford defeated Tony Concepcion of Houston, Texas, USA (AKB 3-1, AB 3-0, 185, 5'8", 29, 11-16-77 Kru Pons (832) 330-1043) by unanimous decision 30-27, 29-28 & 29-28. Branndon Hawkins defeated Bill White of Orlando, Florida, USA (11-1/0, 188, 5'11", 24, 1-27-83 Enrique Fanceschi, (407) 352-5446) by TKO at 1:10 of round 3. Archie Fields III of Florence, Alabama, USA, 0-0, 188, 6'2", 4-15-87 Gerald Steeley, (256) 766-1730 was a NO SHOW. Namesvalery Zheuna of Minsk, Belarus 13-5, 84kg/184, 176sm, 5'7", 22, 10-27-84 Evgeni Kotelnikov & Alfit Khakov, +375-29-6135531 thought he had his Visa in order but apparently did not. Heavyweight: 190.1 lbs. - 215 lbs. - 86.4 kg - 97.7 kg. SECOND: Mike Jones of Calhown, Georgia, USA (1-1/0, 215, 6'1", 38, 8-4-68 Ben Kiker, (706) 226-3318 ) by forfeit. Jones pulled out Sunday morning when he announced to the IKF that he had injured his foot in his prelim bout with Justin Steckler. Mike Jones defeated Justin Steckler of Fredricksburg, Virginia, USA (5-9/0, 210, 5'11", 24, 2-19-83 Chris Manuel, (540) 907-1428 ) by TKO - Corner threw in the towel- at 1:48 of round 3. Wade Haynes defeated Michael Decker of Sewell, New Jersey, USA (9-3/1, 195, 6', 31, 9-29-75 Phil Malounago, (856) 728-0606 ) by unanimous decision 30-28, 29-28 & 29-28. SECOND: Mark Adams of Douglasville, Georgia, USA (8-4-1/0, 213, 6'1", 34, 2-2-73 Mike Wood, Self: (678) 715-1187 ) by unanimous decision 29-25, 29-28 & 29-25. Wallace Britton defeated John Savage of Grove Port, Ohio USA (3-1/1, 201, 6'1", 9-18-73 Larry Lucas, (614) 774-0894 ) by KO at 1:02 of round 1. Mark Adams defeated Mike Moore of Ashburn, Georgia, USA (0-1/0, 210, 5'9", 33, 9-22-73 Ken Hudson, (229) 931-0006 ) by split decision 30-27, 30-27 & 28-29. Wallace Britton defeated Gilroy Carter of Americus, Georgia, USA (0-1/0, 215, 5'11", 23, 11-28-83 Ken Hudson, (229) 931-0006) by TKO at 1:34 of round 2. Joel Morris of Vacaville, California, USA, 0-0, 205, 5'11", 11-15-87, 19, Aurelio Pegg, (707) 447-7699 NO SHOWED. SECOND: Jozlin Goodman of Orlando, Florida, USA, (2-1/1, AB" 1-0/1, 199, 6'3", 30, 6-23-77 James Rautson, (321) 663-5993) by Knock Out at 1:10 of round 1 by spinning backfist. John Ladd defeated Robin Finley of Calgary, Alberta, Canada (4-5/3, 208, 6'1", 36, 1-21-71 Mike Miles, (403) 244-8424 ) by KO at 1:33 of round 2. Jozlin Goodman defeated William Bennett of Columbus, Ohio, USA (4-1, A/MMA: 1-0, 200, 6', 40, 3-24-67 Self, (614) 492-9529) by TKO at :24 seconds of round 3. SECOND: Eric Rivera of Davie, Florida, USA (10-5/3, 230, 6'2", 24, 12-2-82 Jose Mauricio Caal, (954) 472-2554) by forfeit. Late Saturday night Rivera's camp informed the IKF that he had to leave early Sunday for Military duty. The IKF tried to contact Petkov in the hotel but could not find him because his room was under someone elses name. Sunday morning the IKF kept announcing for Petkov to come to the podium to discuss the possibilities of moving the bout up earlier in the day, but Petkov and his camp never answered the page and could not be found. 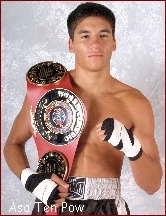 Rivera was forced to forfeit his title shot when he had to leave. Finally at about 12:00 PM Petkov entered the venue and was informed of the situation. It's too bad that these circumstances played out the way they did for what could have been a great Championship bout. Petkov was awarded the title by Forfeit. Iliyan Petkov defeated Cesar Cesareo of Orlando, Florida, USA (0-1/0, 251, 6'2", 38, 8-1-68 Self, (321) 217-3239 ) by TKO at the end of round 2 when Cesareo's trainer threw in the towel. Eric Rivera defeated Derek Thomas of Kalamazoo, Michigan, USA (7-4/5, 223, 6'3", 34, 7-10-73 Self (269) 267-4385 ) by TKO at 1:52 of round 2. Welcoming fighters from mainland Europe has always been a problem due to things such as Visa requirements to their amateur vs pro status. Many in Europe are allowed to fight as amateurs and pros and jump back and forth with sanctioning bodies such as WAKO. Although unethical to the fight world, WAKO's definition of a "Professional" fighter is different than anywhere else in the world. The IKF continues to use the definition of a Professional fighter is one that receives a financial fight purse for their performance. To Wako, a fighter must make a full time living as a kickboxer to be called professional. With that definition, we don't believe there are ANY Professional kickboxers in the entire world... At least according to Wako. Here are the fight stats of the many fighters who were not allowed to fight in this years 2007 IKF World Classic Tournament. In all, if "Numbers and Money" were the only thing the IKF cared about, this years IKF World Classic would have registered almost 300 fighters and had an additional income of over $4,000. With the IKF, "Ethics" and "Fair Play" weight far more than "Numbers and Money." 43 European Fighters were refused registration by the IKF after the IKF discovered they had fought Professional in Europe. Their fees were all refunded. 28 North American Fighters were refused registration by the IKF after the IKF discovered they had fought as a Professional fighter in either Kickboxing, Boxing or mixed Martial Arts. Abraham Han defeated Steven Price Jr. of Martinez, Georgia, USA by knock out at 19 seconds into round 1.